Sponsors: Dean Case Racing Engines, Peerless Restoration and Carpet Care, Middle Peninsula Insurance and Financial Services, Atlantic Specialty Lines, Williamsburg Outlet Mall Inn, Kinfolks Knives. “Racing is something my family has always been involved in,” Matt Slye, driver of the #33 Modified. Born in New York and now living in Williamsburg Slye has very fond memories of going to the races at Oswego Speedway with his family, growing up watching his uncle Mark race. “My uncle was… or is a very successful racecar driver and my grandfather was very involved with his racing,” commented Slye. Racing was a common bond Matt shared with his grandfather not to mention something he always wanted to try. “I raced a Grandstock back in 06 and 07,” Slye tells The Weekly Racer. “I didn’t have much success which was touch for me!” He was used to showing up to the track with his uncle and winning. I can see how that would be frustrating, think about something in your personal life or work life where you were good. Now think about when your boss saw how good you were, or you thought you were good and took another job with more responsibility only to find out it wasn’t working out! Matt would end up selling that car and didn’t run another race till much, much later. “Mark had a lot of success in the modified division, so we decided to go back to what we knew.” Matt also told us the moment he first got into one he had made up his mind what he wanted to race. “Light car, small tires, and lots of horsepower makes for a good time!” The team had Bret Hamilton, well known chassis builder in the modified division, build a brand new chassis for them. 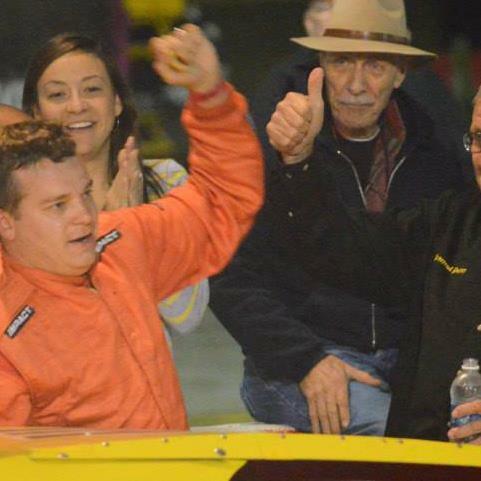 The crew ran their first season in the modified at Langley Speedway ultimately finishing the season fourth in points and taking home Rookie of the Year honors. The following year was a bit tough for Slye and his team, only running a partial season. 2014 was another short year for the team due to funding, Slye however, was not far off the pace when he did hit the track in 2014. Running just 5 races that year the team was able to finish inside the top five in each one. Not to mention grab a pole and a win, a win I feel was a little over shadowed but a win nonetheless! Plans for the 2015 season are still up in the air a bit as the team still looks for funding, “If the money comes through we will be racing a lot. Mark caught the racing bug again decided to build a new modified so we plan on having him at some races, me at some races, and both of us at a couple or races.” The team seemed pretty excited and optimistic about what the 2015 season has in store for them.